ISBN 9790006526413. 30 x 23 cm inches. Text Language: German/English. Preface: Karl-Peter Chilla. 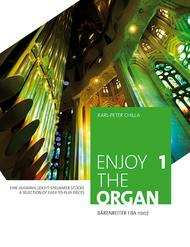 Enjoy the Organpresents attractive organ pieces from the 18th and 19th centuries that are manageable on smaller instruments and, even with little practice time, lead to impressive results. These pieces are intended primarily for the amateur organist but can also be of interest to the professional who can use these as a starting point for improvisation.